At the Bangkok Snake Farm (Queen Saovabha Memorial Institute) there are of course a lot of snakes, especially poisonous ones. 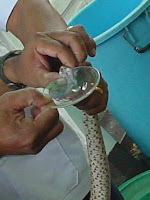 The farm was founded to produce an antidote for the most common Asian snakes. The snakes are milked regularly (the poison is pushed out of their glands), with the poison they vaccinate horses on the accompanying horse farm (not on show) and later they retrieve the antidote from the horses' blood. (c) cafavier. Last Updated Feb 2019. All rights reserved.